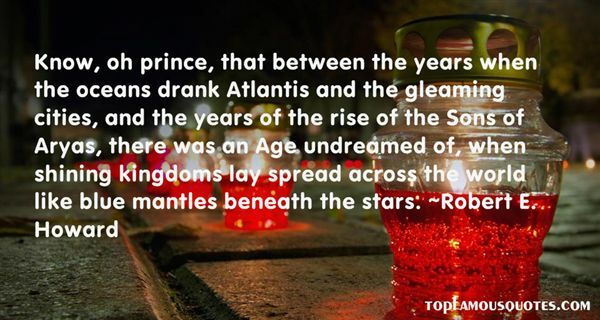 Reading and share top 27 famous quotes and sayings about Atlantis by famous authors and people. 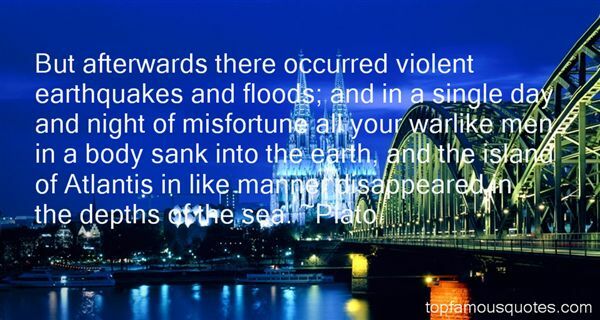 Browse top 27 famous quotes and sayings about Atlantis by most favorite authors. 1. 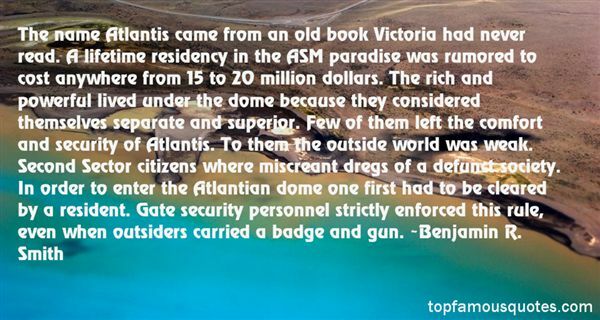 "The name Atlantis came from an old book Victoria had never read. A lifetime residency in the ASM paradise was rumored to cost anywhere from 15 to 20 million dollars. The rich and powerful lived under the dome because they considered themselves separate and superior. Few of them left the comfort and security of Atlantis. To them the outside world was weak. Second Sector citizens where miscreant dregs of a defunct society. In order to enter the Atlantian dome one first had to be cleared by a resident. Gate security personnel strictly enforced this rule, even when outsiders carried a badge and gun." 2. "Who built Thebes of the seven gates?In the books you will find the name of kings.Did the kings haul up the lumps of rock?And Babylon, many times demolished.Who raised it up so many times? In what housesOf gold-glittering Lima did the builders live?Where, the evening that the Wall of China was finishedDid the masons go? Great RomeIs full of triumphal arches. Who erected them? Over whomDid the Caesars triumph? Had Byzantium, much praised in song,Only palaces for its inhabitants? Even in fabled AtlantisThe night the ocean engulfed itThe drowning still bawled for their slaves." 3. "Atlantis will rise again." 4. "It's like a memorial to Atlantis or Lyonesse: these are the stone buoys that mark a drowned world." 5. "I have read that long ago there was a land of glass castles that sank beneath the sea. It was not called Atlantis, but Lyonesse. This happened before history and across the ocean, but when I was little I wondered about that place, how it could be so beautiful and so lost. Sometimes it seemed that the land around my New England home was like that flooded country, with mud where the streets of gold should be and mayflies swarming where there should be lovely fishes, but here and there a shard of crystal to call the heart to beauty. --"Wetlands," in Phoebe." 6. "I wish I hadn't cried about a girl a couple of months ago so I would have more tears for this moment, this moment that rips up the term reality, forever un-marries it from the word boring. I am also, I have to admit, terrified, because I have always lived in this one world, and I am leaving it, right now in this moment, for a whole different one. I imagine it's a lot how leaving for college feels, if you were going to college in Atlantis." 7. "Herman Melville was as separated from a civilized literature as the lost Atlantis was said to have been from the great peoples of the earth." 8. "Hardly worth the effort, really," he muttered. "It's a homunculus lock. Only opens when a predefined set of factors is present. Could be it only opens when a redheaded lass sings the national anthem of Atlantis at three o'clock on a Thursday. Or when the light of the setting sun is reflected from a cracked mirror onto a goat's eye. Or when Mr. Grey hawks a bogey onto a purple newt. I've seen some good homunculus factors in my time, yar." 9. "NASA projects often have romantic names that link into a long history of exploration and adventure: Atlantis and Discovery, for example." 10. "With favoring winds, o'er sunlit seas,We sailed for the Hesperides,The land where golden apples grow;But that, ah! that was long ago.How far, since then, the ocean streamsHave swept us from that land of dreams,That land of fiction and of truth,The lost Atlantis of our youth!Whither, ah, whither? Are not theseThe tempest-haunted Orcades,Where sea-gulls scream, and breakers roar,And wreck and sea-weed line the shore?Ultima Thule! Utmost Isle!Here in thy harbors for a whileWe lower our sails; a while we restFrom the unending, endless quest." 11. "Love is like Atlantis, OK? And I'm just a humble scuba diver searching for treasure that I can exchange for sexual favors." 12. "In imagination she sailed over storied seas that wash the distant shining shores of "faëry lands forlorn," where lost Atlantis and Elysium lie, with the evening star for pilot, to the land of Heart's Desire. And she was richer in those dreams than in realities; for things seen pass away, but the things that are unseen are eternal." 13. "God will break California from the surface of the continent like someone breaking off a piece of chocolate. It will become its own floating paradise of underweight movie stars and dot-commers, like a fat-free Atlantis with superfast Wi-Fi." 14. "This time Simone did not smile at all. "I cannot tell that to you, child. This is asecret I am not allowed to talk about. I only hope that you willknow how to follow the true and right path. And now, farewell!" Sheturned around and walked away between the bookshelves, disappearingfrom their sight.Nirupa looked at the book she held in herhand. On its thick front cover she read:"Atlantis. "Deep shudders shook her body. She turned herhead and looked at Miss Bell, who also looked numb with fear. "Now that we have started the adventure, memust carry it through to the end," Ni whispered to Miss Bell,opening the book. She did not have time to see what was writteninside because, once the first page was open, a whirl of warm airsucked Ni and Miss. Bell inside, In the twinkle of an eye theyfound themselves standing up on the main street of a magnificentbazaar." 15. "In reality it was like this: Earth was colonized by the Zycronites, who developed the ability to travel from one space dimension to another at a period several millennia after the epoch of which we speak. They arrived here eight thousand years ago. They brought a lot of plant seeds with them, which is why we have apples and oranges, not to mention bananas—one look at a banana and you can tell it came from outer space. They also brought animals—horses and dogs and goats and so on. They were the builders of Atlantis. Then they blew themselves up through being too clever. We're descended from the stragglers." 16. "Her skirts, sleeves, collar, and hat saw to it that none of the young ruffians of the Leased Territories would have the opportunity to invade her body space with their eyes, and lest her distinctive face prove too much of a temptation, she wore a veil too...The veil offered Nell protection from unwanted scrutiny. Many New Atlantis career women also used the veil as a way of meeting the world on their own terms, ensuring that they were judged on their own merits and not on their appearance. It served a protective function as well, bouncing back the harmful rays of the sun and intercepting many deleterious nanosites that might otherwise slip unhindered into the nose and mouth." 17. "But afterwards there occurred violent earthquakes and floods; and in a single day and night of misfortune all your warlike men in a body sank into the earth, and the island of Atlantis in like manner disappeared in the depths of the sea." 18. "Architects have to dream. We have to search for our Atlantises, to be explorers, adventurers, and yet to build responsibly and well." 19. "Know, oh prince, that between the years when the oceans drank Atlantis and the gleaming cities, and the years of the rise of the Sons of Aryas, there was an Age undreamed of, when shining kingdoms lay spread across the world like blue mantles beneath the stars." 20. "He shifted her closer, his hand curving into the small of her back to flatten her against his lean, hard body as he showered soft, repentant kisses over her lips and cheeks, her closed eyelids, her tangled hair. "I should've left you on the Chastity," he whispered against her mouth. "Atlantis is all right for the others but not for you." 21. "D?n dà chúng ta dem theo c? nh?ng Atlantis bên mình: ta nhìn xu?ng dáy sâu, và du?i l?p bùn bao ph? ta th?y c? hình thù c?a nh?ng xã h?i dã bi?n m?t, b?a an t?i vào m?t chi?u tháng Sáu quanh chi?c bàn an gia dình v?i nh?ng ngu?i dàn ông râu v?nh, m?c áo choàng m?ng và nh?ng ngu?i dàn bà m?c áo h? ng?c thêu ren tr?ng vàng, u?ng sô cô la sóng sánh b?t b?ng nh?ng chi?c c?c vi?n vàng, và dàm d?o v?i v? l?ch s? châm bi?m; th?y gánh xi?c v?i nh?ng con tu?n mã sang tr?ng và nh?ng ph? n? thu?n du?ng ng?a m?c váy l?a m?ng, phi nhu bay trong r?p; th?y m?t hoàng d? di qua m?t thành ph? và v?y chào dân chúng; m?t bìa thi t?p cu n?m l?n trong m?t c?a hi?u buôn bán sách; m?t can phòng vu n? trên gác ba ngôi nhà ph? Izabella, lúc nam gi? chi?u; t?t c? v?n còn, nhung ch? nhu nh?ng v? d? h?p han g?, nh?ng b? xuong ngu?i mà cá bi?n dã r?a h?t ph?n m?m, và nh?ng c?t dá c?m th?ch dã chìm khu?t c?a Atlantis du?i dáy d?i duong." 22. "Have any of you taken a look out at Greece in the last, say, hour or so? (Hermes)What? Are they reacting to the fact I cursed the Apollites? (Apollo)I don't think that bothers them nearly as much as the fact the island of Atlantis is now gone and the Atlantean goddess Apollymi is cutting a swathe through our country, laying waste to everyone and everything she comes into contact with. And in case you're curious, she's headed straight for us. I could be really wrong here, but I'm guessing the woman's extremely pissed. (Hermes)"
23. "Atlantis: Fabled. Mystical. Golden. Mysterious. Glorious and magical. There are those who claim that it never was. But then there are also those who think they are safe in this modern world of technology and weapons. Safe from all the ancient evils. They even believe that wizards, warriors, and dragons are long dead. They are fools clinging to their science and logic while thinking it will save them. (Thrylos)"
24. "Simple. Atlantis can't be found." He scoffed at her. " You're the second person to tell me that in less than an hour." 25. "Yet you're helping me. Why? (Arik)Nothing better to do. Eternity is boring. Really boring. I'm hoping that when you pop the seal on Atlantis, there will be a giant explosion to add some humor and interest to my life. If we're really lucky, Apollymi will come out and thoroughly entertain us with a massive fireworks display. Hell, if she does half of what she did last time, there will be belly rolls aplenty for those of us who hate the Olympians and humanity. (Solin)"
26. "Kau tidak perlu memiliki ibu yang sempurna untuk menghormatinya, Daca. Siapa pun ibumu, dia berhak engkau kenang dan engkau cintai.- Wamap Suli : Nibiru dan Ksatria Atlantis"
27. "Die älteste Sprache, sagt man, sei das Indogermanische, Indo-europäische, das Sanskrit. Aber es ist so gut wie gewiß, daß das ein "Ur" ist, so vorschnell wie manches andere, und daß es eine wieder ältere Muttersprache gegeben hat, welche die Wurzeln der arischen sowohl wie auch der semitischen und chamitischen Mundarten in sich beschloß. Wahrscheinlich ist sie auf Atlantis gesprochen worden, dessen Silhouette die letzte im Fernendunst undeutlich noch sichtbare Vorbirgskulisse der Vergangenheit bildet, das aber selbst wohl kaum die Ur-Heimat des sprechenden Menschen ist." Man cannot do without beauty, and this is what our era pretends to want to disregard."